I put up a new version of the Ninja All Stars Tools. The biggest feature this time around is the Team Builder. 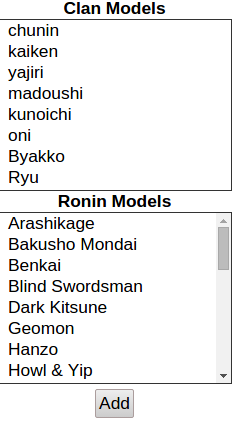 Which allows you to create a team roster of any of the clans and Ronin. It displays your teams stats, keywords, and abilities. Here's an intro video for it. You may be asking what is JSON or you might already know; in either case let's look at an example. and this blending showed him his true path, as a perfect balance of schools and clans. That balance shattered when he witnessed his fellow students apparently murder his Tora master. while he is on elevated terrain he gets +2at"
After the JSON gets loaded I emit out an event telling the Team Builder page to build out its clan and ronin lists. The Drag and Drop functionality I get pretty much pain free from jQuery UI. Once the page is loaded with it's data after that point it's a client side only application. It doesn't have a need to poll back to the server for any of it's data. That also means that any interactions the user has with the page is impermanent, and will simply vanish with a page reload. However setting up a roster literally takes only a minute or so and it's a trade off for now. I plan on adding features for saving and loading team rosters. A help button to describe the Drag and Drop functionality, and other modilifier clicks. Pointer indicators to better highlight interactions users can have with the page. The most most requested feature is the Team Advancement. It's also the least straight forward to implement.